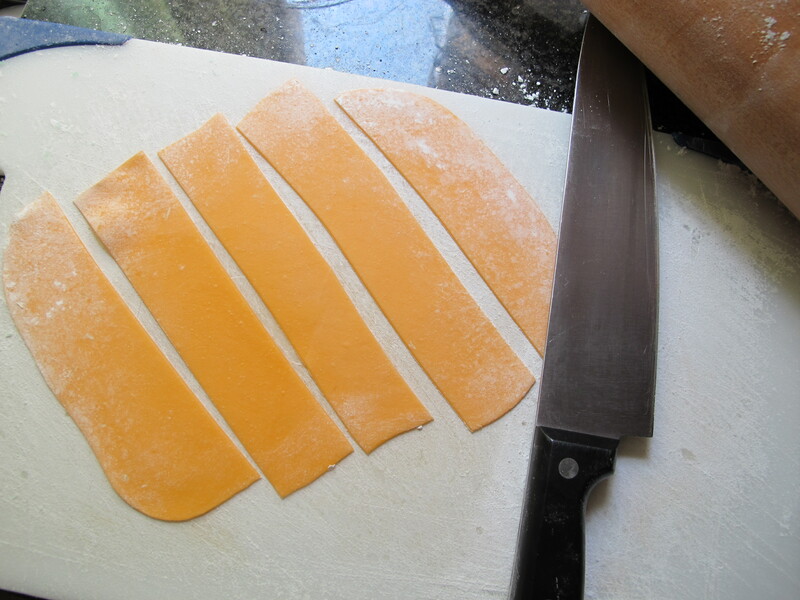 For the body, I think I used three or four 9″ round pans, cutting the circles at varying sized semi-circles. For the head I used 1/2 of an egg shaped pan. For the legs, I used the larger crushed tomato cans, but not the largest (you will need 4). After baking the cakes, cool to room temp., wrap with plastic wrap, and then cool in the fridge for easier handling and cutting. Using three 9″ round pans fed more than 75 or so guests with plenty of leftovers. 3. Take the third 9″ round, cut off the top of the cake to make it flat on both sides, and then cut the cake in 1/2 (2 equal portions). (See green line in Fig. 1 below for rough cut location). 4. Optional – If you are having a really big party and want to incorporate more cake, take a fourth 9″ round, cut off the top to make it flat on both sides, and then cut the cake in 1/2 as in step #3 above. (See green line in Fig. 1 below for rough cut location). Fig. 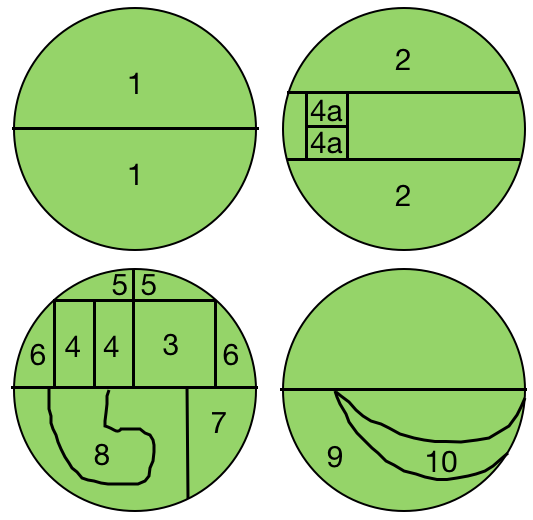 1 – Cutting locations for round cakes to get varying semi-circle sizes. 5. Stack the semi-circles with the cut side down in order of height, starting w/ the largest semi-circle from step #1 (cake piece #1 in Fig. 2 below), followed by the 2nd largest semi-circle from step #2 (cake piece #3 in Fig. 2 below). Glue the 2 cakes together using frosting. Remember to place the flat sides of the cake side-by-side. The larger semi-circle should have a “puffed” out side since the top of the round cake was not cut off. 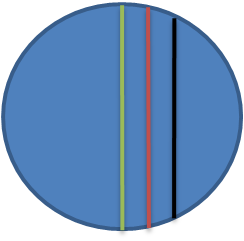 This should be facing out and the flat side should be facing the other semi-circle. Place 1/2 of the round (cake piece #5 in Fig. 2 below) next and frost in between each layer. Do this until you have used up all of the semi-circles. If you are doing the optional step #4, then you will place cake pieces #5, 6, 7, 8 and then #4 and #2, lastly. (Note: Please feel free to rearrange the cakes to make the shape of the body. I’m going by memory and it may not be the best, so if you want to rearrange the semi-circles to make it look more like a body, then do so! 😀 ). Place the cake pieces in order of: 1, 3, 5, 6, 4, 2 or 1, 3, 5, 6, 7, 8, 4, 2 for a bigger cake. 6. Crumb coat the body (i.e., frost with thin layer of frosting to capture all the crumbs). Put fridge in the coolest setting and place body in fridge for as long as you can. You will want the body very firm for the head, which will be skewered into the body. 7. For the head, use 1/2 of an egg shaped pan. The side touching the pan will be the face of the Triceratops. Crumb coat and cool in the fridge. Once crumb coat has set, frost the head with the desired color (matching the color of the body – I used leaf green and moss green colors to get the green color of my triceratops). 8. Measure the body length and width and cut out cake board #1 to that size or slightly bigger. Cover the cake board with cake foil. Like the Firetruck cake, I used toy blocks to elevate my Triceratops body. Find a larger cake board #2 and wrap in cake foil. Use board books or toy blocks and wrap in foil. Tape the toy blocks or board books under cake board #1. Make sure it is very secure and make sure you have spaced out the toy blocks/board books so it supports the body of the Triceratops cake very well. Tape and secure very well, cake board #1 to cake board #2. 9. 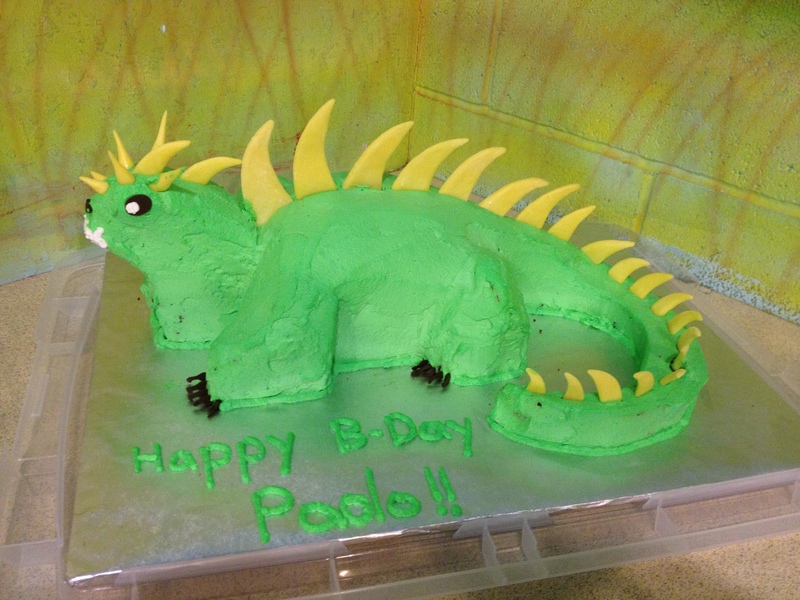 Place the Triceratops cake body on top of the cake board #1. Use a large spatula on either end. 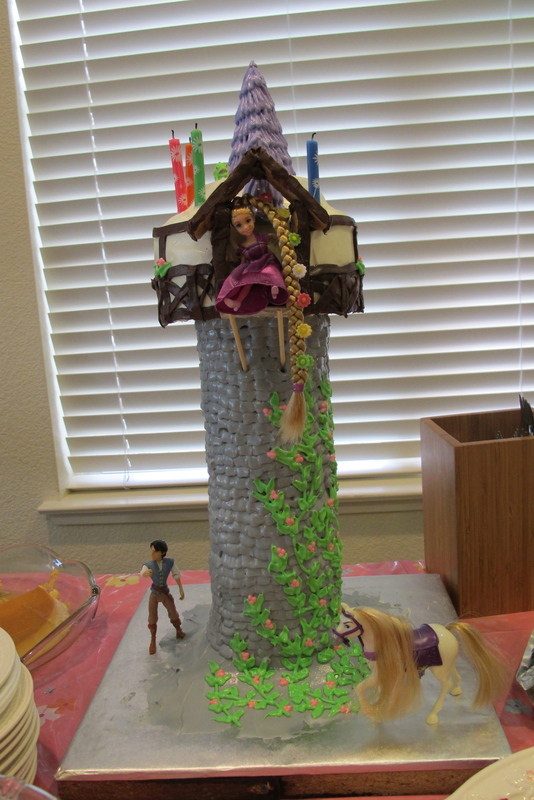 You may need help here to spot the cake so it does not fall in the process of transferring. 10. Place a cake baked from the tomato sauce can next to the body. Sculpt the legs so that it blends in w/ the body. Place the remaining 3 cakes backed from the tomato sauce cans next to the other corners of the body. Secure the legs to the body using bamboo skewers. Crumb coat all four legs and put back in fridge to set. Note: When baking cakes in tomato cans, wash cans thoroughly, dry, line w/ parchment paper, spray w/ Pam oil or baking spray, and bake. This makes it easier to remove the cakes after baking. 11. 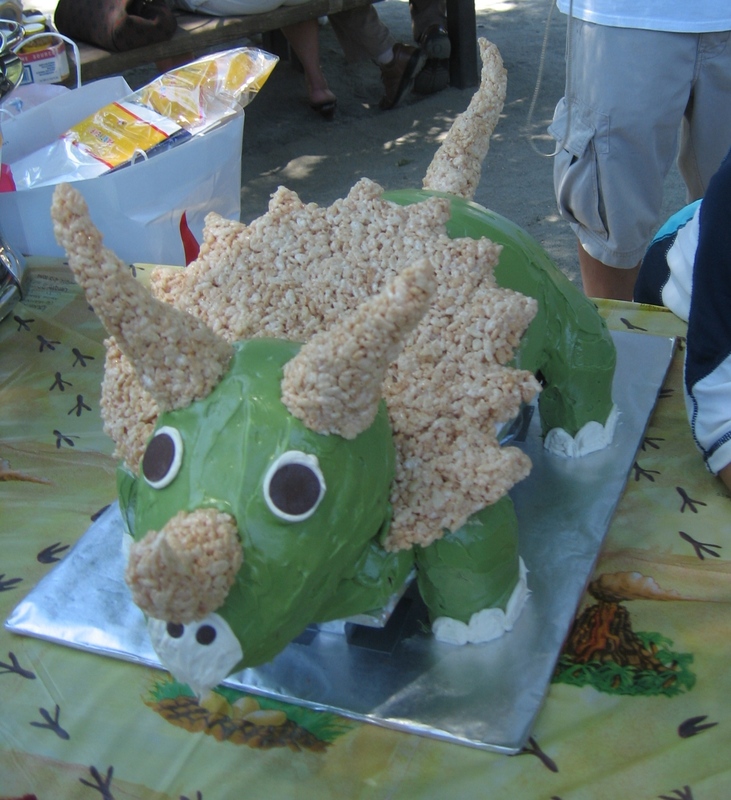 While Triceratops is “chilling” in the fridge, get started on the rice krispies horns, crest, and tail. Use the rice krispies directions. The only difference I would like to add is to cook the marshmallows a little bit longer from when then melt. If you make the rice krispies treats soon after the marshmallows melt, the treats will be very soft and may not hold their shape. I found that by cooking the marshmallows a bit longer, the treats are a bit harder and can retain their shape better. 12. Coat your hands with canola oil and shape the treats into the horns. 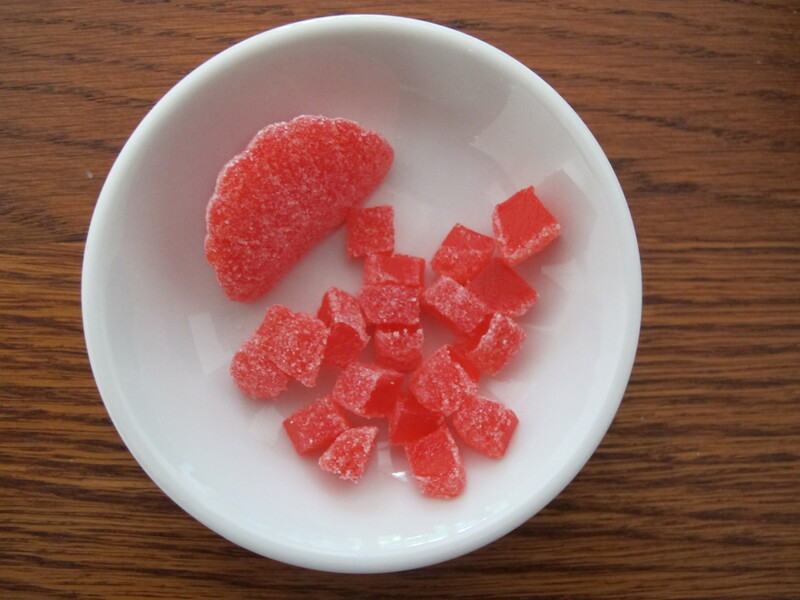 Place the shaped treats onto wax paper. For the crest, I pressed the treats down on wax paper to compress them and used a cutting board to flatten them out. I shaped the tips of the crest w/ my hands, but another option would be to cut out triangles. Why didn’t I think of that when I was doing it! It was probably 3am in the morning when I was making mine and wasn’t thinking clearly. Shape the tail as you would the horn, but longer. 13. 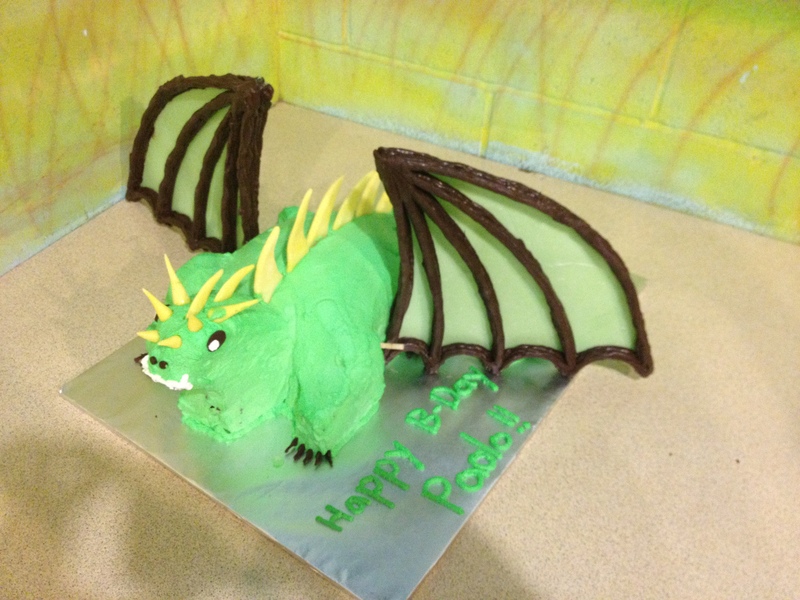 Do the final frosting on the body and leg of the Triceratops. Take the head, holding it underneath, where there is no frosting. Place the head on the shorter or smaller side of the body. The head should be somewhat above the body so the head is slightly supported by the body. Don’t use the skewers to try to support the head on it’s own! The head will eventually fall of the cake! Use part of the body to support the head. Use the bamboo skewers to keep the head in place. I don’t remember how many skewers I used for the head, but I know I used a lot. I placed the skewers at different angles to make sure the head is very secure. If you are transporting the cake (as I did), this step is very important. If it wobbles, add more skewers to give it more support. 14. Touch up the frosting on the cake if it was mangled with the head placement and skewering process. Add white frosting for the eyes, nose, and toes. Feel free to use any frosting color you like. I think I was planning on using gray, but ran out of time, so just used white. 16. Use the Cocoa melts from Wilton for the eyes and regular chocolate chips for the nose. 17. I assembled the horns, crest, and tail at the party because I was paranoid about transportation. You can do it ahead of time if you like. If you want to wait like I did, prep the horns and tail by skewering them. Make sure you leave enough of the skewer showing so that it can attach to the head and the body securely. For the crest, I cut a big notch for the neck or back of the head of the Triceratops and just placed on. There was no way for me to raise it up as my rice krispies were too soft. If you make them hard like I mentioned above, that should be no problem for you! Good luck and let me know how it goes! Please send me a pix as I’d love to see it! I finally had time to do this! Thanks for your patience. 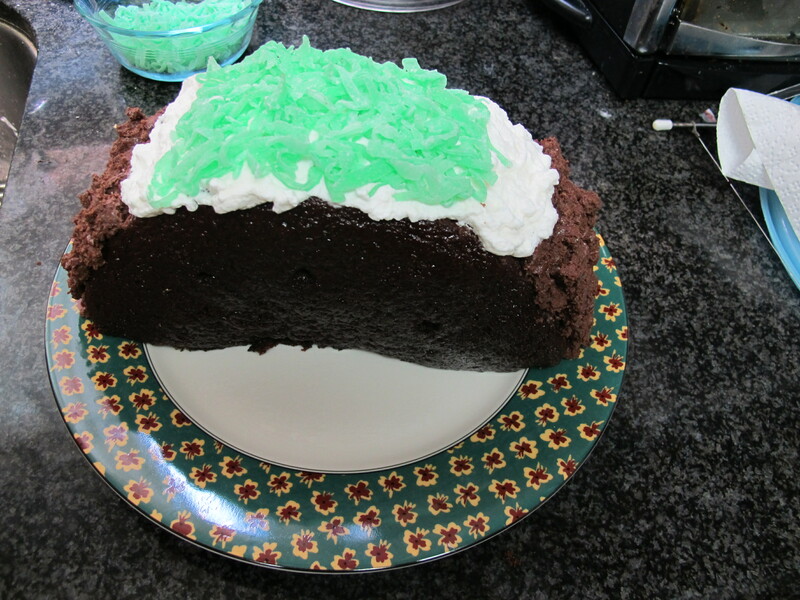 Part I refers to the size of the cake. These directions will utilize two 9×13 pans and can easily feed 24-30 people depending on how big the serving size. I would recommend doing a trial run first if it is for a special occasion. I tried this for the first time for a friend’s birthday party and it took a lot of time because I was guessing at how to cut the cakes without making mistakes! Bake two 9×13 pans of your favorite cake recipe. Bear in mind the best kind of cake to use is a somewhat denser type cake. The softer the cake, the harder to cut, shape, and stack. It will also have more crumbs. After the cakes have cooled at room temperature, wrap them in plastic wrap well and cool for a couple of hours in the refrigerator. The plastic wrap will help retain the moisture of the cake and cooling in the refrigerator will make it easier to cut it into shapes. 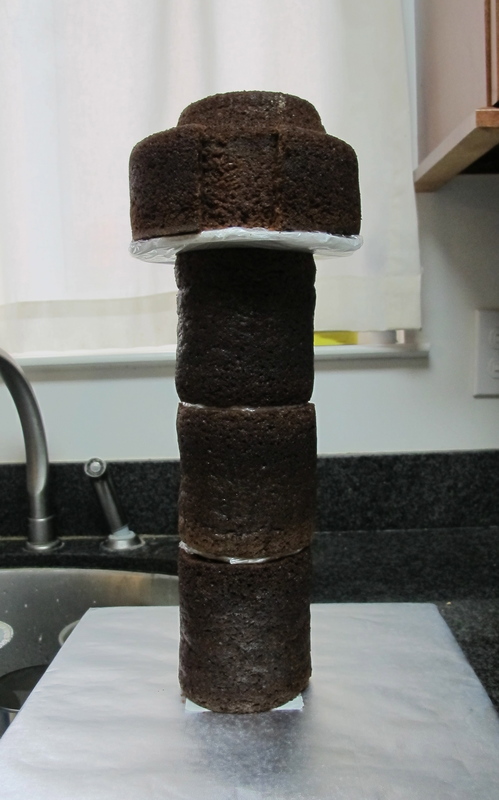 One word of caution, since cake recipes vary, you may need to do a 3 stack to obtain the height of the fire truck cake. One thing I have done in the past (for other cakes) is make 3 recipes and split between the two 9×13 cake pans. This will feed more people (~50-60) and will probably require only 2 layers to make the fire truck. The following recipe is for 2 cake recipes, hence 3 layers of cake. 2. Cut off the hard edges to straighten out the edges (this is if you have a typical 9×13 pan where the edges flare up and outwards). If you have a cake pan with straight edges, you can skip this part. With my cake pan, I end up with an 11.5″ x 8″ rectangle. Note: It might be easier to stack the 2 cakes before slicing off the edges to make sure they are “sized” the same or close to it. 3. With the cakes stacked, cut 4.5″ from the 8″ side to form a 4.5″x8″ block. Repeat so you have 2 blocks. 4. Frost between the stack of three 4.5″x8″ cakes. 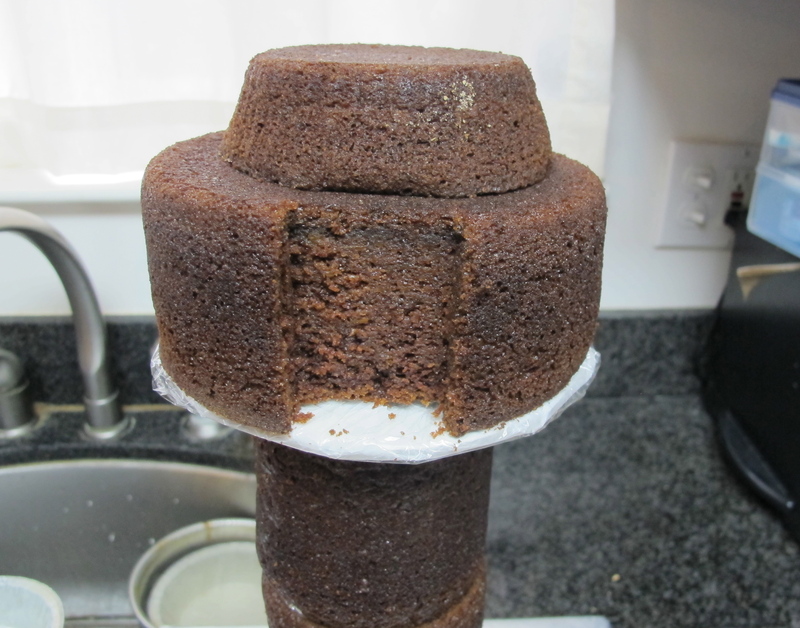 Cut the 4th 4.5″x8″ cake piece into two equal pieces (sized 4.5″x4″). Frost between the stack of the two pieces. 5. You should have two 2.75″x8″ pieces left. Cut one of the pieces into two equal pieces (sized 2.75″x4″). Stack one piece on top of the 4.5″x4″, aligning the edges. You will need to cut the other 2.75″x4″ piece to fill in the “missing” section of the 3rd layer (should be 1.75″x4″). So, you should have one 4.5″x8″ stack of 3 cakes and one 4.5″x4″ stack of 3 cakes, where the last cake layer is 2.75″x4″ plus 1.75″x4″. These 2 blocks of cake should be the same height. Try your best to frost in between each layer evenly so they are the same height. 6. Trim down the last 2.75″x8″ piece to 1.25″x8″ and then cut it in half to form two 1.25″x4″ pieces. Stack the 2 layers and frost in between. 7. For the cake board, you can do as you wish, but I wanted my firetruck to “levitate” on the wheels, so I cut a cake board into a 4.5″x13.5″ rectangle. Wrap the cake board with cake foil. Realize though that it is harder to frost the outside of the cake with a really small rectangle. It can and will get messy! 8. Place the cake pieces on the cake board. The front of the firetruck will be the 4.5″x4″ piece, where the window is the 4.5″ side. Then place the 1.25″x4″ cake block behind it, followed by the 4.5″x8″ block. 9. 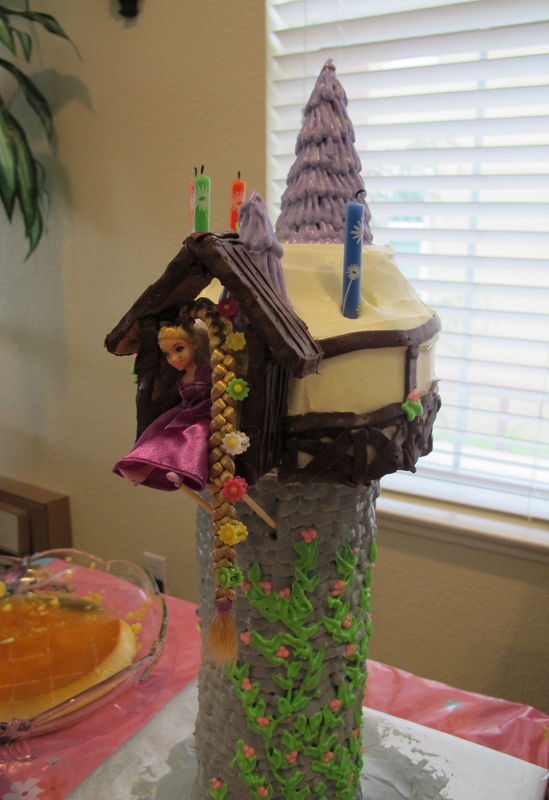 At a slant, trim from the top of the firetruck front (maybe 0.5″ to 1″ from the edge down to 1/2 the cake height. You will need to use your judgement here because I don’t have a cake to experiment with me right now, so I’m just visualizing. You are doing this to form the window of the firetruck. The portion you trim off should be like a triangle. You can refer to the picture attached to see how I trimmed the window. 10. If the firetruck looks a bit unstable, use skewers to stabilize it. Pound the skewers in with a hammer down to the cake board for stability and so the parts don’t move around during handling or transport. How many you use will depend on how unstable your cake is. The denser the cake, the more stable it will be. The taller the cake, the more unstable it will be. The flatter or more even the cake you cut, the more stable it will be. Cut the tops of the skewers with clean pliers as close to the top of the cake as possible, so it doesn’t stick out during frosting. 11. Color your frosting depending on how you would like your firetruck to look like. I used different coloring schemes for the 2 firetrucks I have made (check my archives). 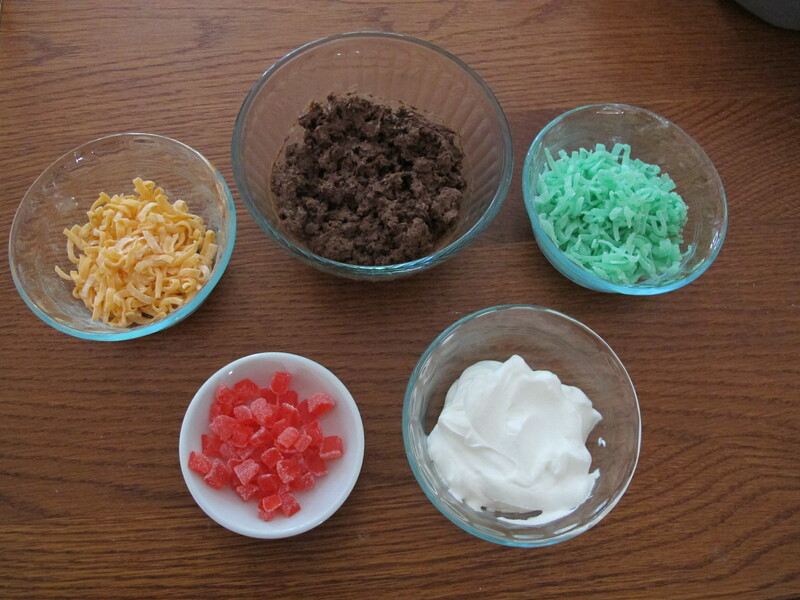 Frost the cake and decorate with different colored frosting lines to give your firetruck personality. 3. Make the side ladders by doing the same as #1 but in smaller dimension. Draw 2 parallel lines 6″ in length and spaced 0.75″-1″ apart. Draw lines to connect the 2 parallel lines to form the ladder rungs. 4. Cover your template with wax paper. Melt 1-2 bags of white chocolate and put in a piping bag. Outline the ladders and H support using the white chocolate. Wait until the white chocolate hardens a bit and then pipe more white chocolate above it and on the sides to “strengthen” the ladder. The first time I did this, the ladder broke, so I decided to re-pipe after the 1st piping “set” to add more strength to the ladder. 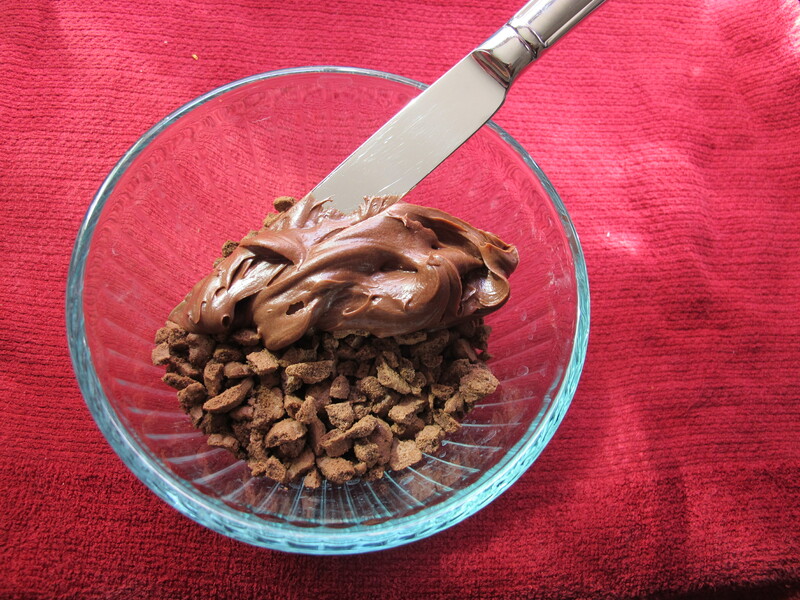 Repeat as many times as you see fit, but do not let the chocolate “run” way outside of your lines. If you do, the ladder might not fit into the H support. This happened to me a couple of times doing this! 6. Once you have 2 sets, remove the 2nd set from the wax paper and repeat only with the large ladder. Pipe 6-8 thick lines ~1″ long. You will use these to hang ladders on the side of the fire truck. And to hold the bottom of the large ladder on top of the fire truck in place. Make sure they are pretty thick so they do not break when you pierce it into the cake. You will need only 6, but an extra 2 never hurts, in case they do break. 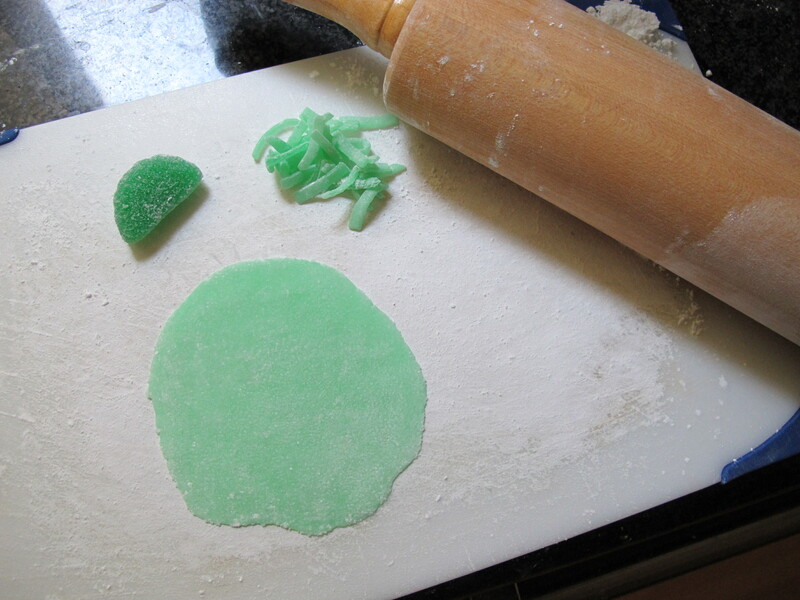 Remove from wax paper and set aside. 7. To make the large ladder atop the fire truck cake, take 1 ladder and lie it flat on wax paper. Take another ladder and vertically place it on one side of the ladder lying flat. Take the melted white chocolate and “glue” the 2 ladders together on their sides. 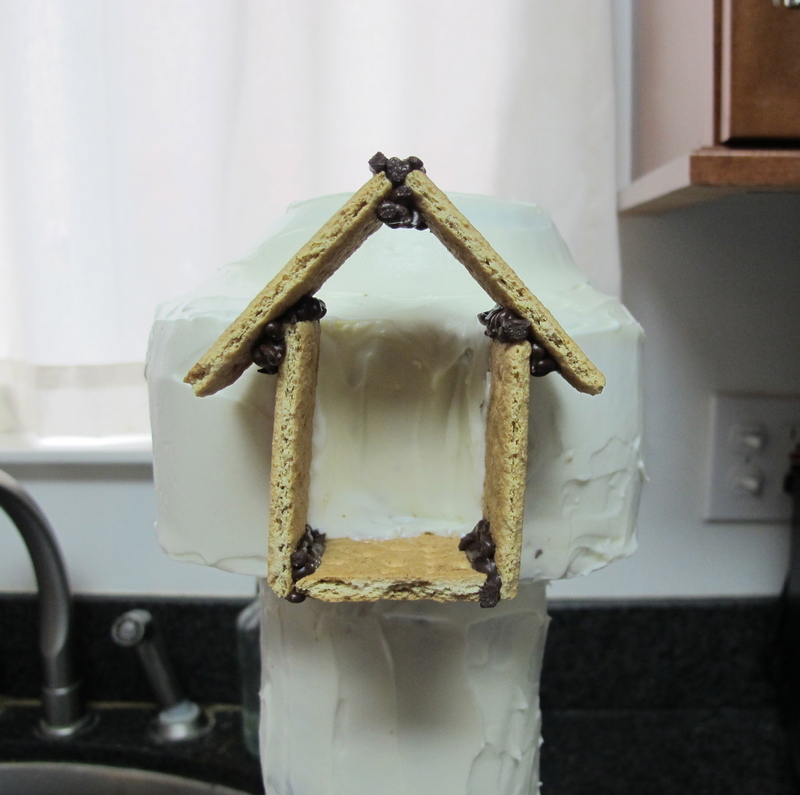 You will need to “glue” on the outside and inside of the sides to make sure they adhere very well together. Make sure the chocolate has “set” and is stable before you let go. If it is not stable, pipe more white chocolate. Repeat on the other side of the ladder lying flat with the 3rd ladder positioned vertically on its side. 8. For this smaller fire truck, I used thin mint cookies for the wheels. Draw circles on the inside of the thin mint cookies to decorate the fire truck wheels. 1. Once you have finished frosting and decorating the cake, place the H support on top of the front of the fire truck. Place the large ladder through it so it is supported by the rung. Gently place the other side of the ladder on the back of the fire truck and take 2 of the 1″ white chocolate lines to secure the end of the ladder. 2. Take 2 of the 1″ white chocolate lines and place on the side of the back of the fire truck to hold the smaller ladders. Do this on both sides of the truck. 3. Take a larger cake board and wrap with cake foil (size of cake board depends on you, but make sure it is larger than the fire truck cake). Use oreo cookies or wooden blocks to “levitate” the fire truck cake on top of the larger cake board. The fire truck cake will slide off the cookies or wooden block if you lift and try to move the larger cake board, so do this as final assembly…when you have chosen the final destination of the cake. 4. Place wheels alongside the fire truck. 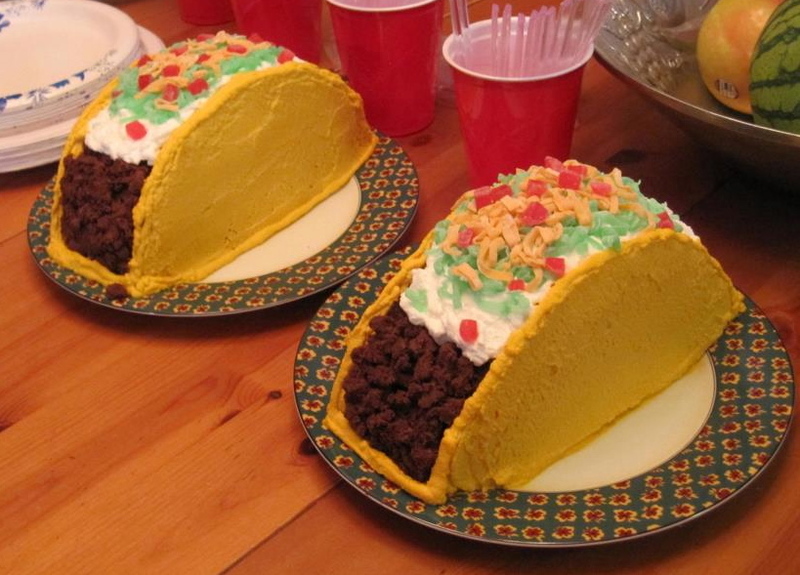 You can press them gently on the side of the cake so they don’t fall or move around. Use jolly ranchers for the sirens and lifesavers for the headlights. 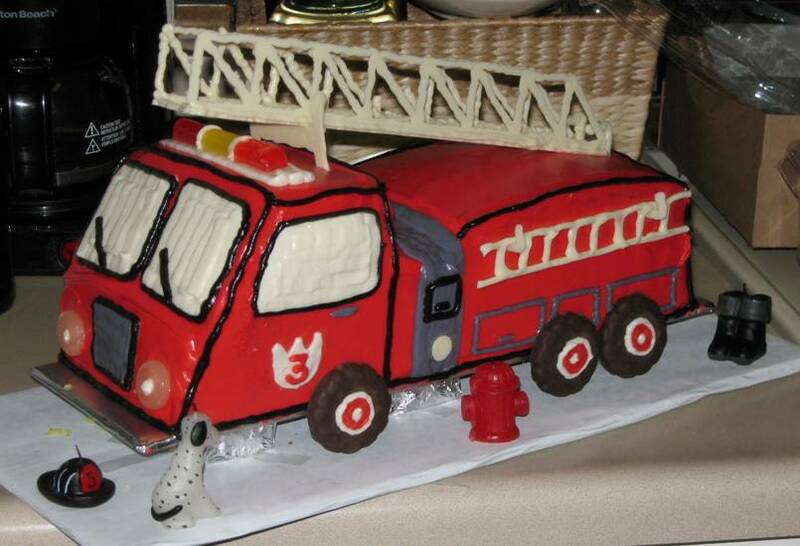 Please send me a picture of your fire truck cake when you make it! And if you post it on the web, please be so kind as to refer to my blog.